For the airport under-construction in North Goa, see Mopa Airport. For the airport with IATA code GOA, see Genoa Cristoforo Colombo Airport. Dabolim Airport or Goa Airport (IATA: GOI, ICAO: VOGO) is the sole international airport in Goa. It is located in Dabolim and operates as a civil enclave in a military airbase named INS Hansa. It is 4 km from the nearest city Vasco da Gama, 23 km from Margao, and about 30 km from the state capital Panjim. The airport's integrated terminal was inaugurated in December 2013. In fiscal year 2017–18, the airport handled over 7.6 million passengers. Due to capacity constrains at the terminal and air traffic congestion due to strong military and naval presence, a second airport at Mopa was proposed and is already under early stage of construction with scheduled completion in 2020. The airport was built, in 1955, by the Government of the Estado da Índia Portuguesa, on 249 acres (101 ha) of land, as the Aeroporto de Dabolim, which was later officially renamed to Aeroporto General Bénard Guedes. Until 1961, the airport served as the main hub of the Portuguese India's airline TAIP (Transportes Aéreos da Índia Portuguesa), which on a regular schedule served Daman, Diu, Karachi, Mozambique, Portuguese Timor, and other destinations. 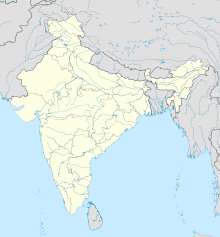 During the Indian annexation of Goa, in December 1961, the airport was bombarded by the Indian Air Force with parts of the infrastructure being destroyed. Two civilian planes that were in the airport – a Lockheed Constellation from TAP (Portuguese International Airlines) and a Douglas DC-4 from TAIP – managed to escape with refugees, during the night, to Karachi. In April 1962, it was occupied by the Indian Navy's air wing when Major General K.P. Candeth, who had led the successful military operation into Goa, "handed over" the airport to the Indian Navy before relinquishing charge as its military governor to a Lieutenant Governor of the then Union Territory of Goa, Daman and Diu in June 1962. For civilian air travel out of Vasco da Gama and Goa, the Indian Navy and the Government of India invited the public sector airline (known now as Indian) to operate at Dabolim from 1966 after the runway was repaired and jet-enabled. A new domestic terminal building was built in 1983, designed to process 350 arrivals and departures simultaneously, while the international terminal, built in 1996 was designed for 250. Once two vital road bridges across the main waterways of Goa were built in the early 1980s, and Goa hosted the Commonwealth Heads of Government Meeting (CHOGM) in 1983, the charter flight business began to take off at Dabolim a few years later, pioneered by Condor Airlines of Germany. In 2006, the Indian Civil Aviation Ministry announced a plan to upgrade Dabolim Airport. This involved constructing a new international passenger terminal (after converting the existing one to domestic) and adding several more aircraft stands over an area of about 4 hectares (9.9 acres). The construction was scheduled to be completed by the end of 2007. However delays in transfer of the required land from the Navy held up proceedings. The modernisation project of Goa Airport was one of 35 airport expansion projects undertaken by the AAI and, in terms of size and money, was its third largest project after the ones at Chennai and Kolkata airports. It included the construction of an integrated terminal building to replace the older terminals, a multi-level car parking (MLCP) facility to accommodate between 540 and 570 cars and construction of additional parking stands for aircraft, among others. The AAI acquired additional land from the Indian Navy and the State Government for apron expansion and the expansion of the older international terminal building complex. The foundation stone for the terminal was laid on 21 February 2009, the project work began in May 2010 and construction of the terminal began in May 2011. The terminal can handle 2,750 peak hour passengers, cost ₹3.45 billion and was inaugurated on 3 December 2013. The airport is spread over 688 hectares (1,700 acres) (and possibly 745 hectares or 1,840 acres) and consists of a civil enclave of nearly 14 hectares (35 acres), an increase from its original size of 6 hectares (15 acres). The civil enclave is operated by the AAI. The Navy's premises straddle the Dabolim runway and consequently its personnel cross at one point (on foot or bicycles or in vehicles) between flights. One point near the terminal constrains the enlargement of aircraft parking space. Of the 130–140 flights daily, there is a very large concentration of civilian traffic in the period between 1:00 pm and 9:00 pm during weekdays, with the balance in the early morning hours. This is because of naval restrictions for military flight training purposes throughout the year. The huge demand during the peak Christmas/New Year tourist season results in the sharp spiking of air fares during this period. Officially, night operations have been permitted and enabled since October 2007 but they have taken place only an ad hoc basis subject to the mandatory clearance of the naval ATC. The airport's integrated terminal building handles both international and domestic passengers. It was opened in December 2013. The building design features aesthetic glass, large steel span structures and frameless glazing. The 62,000 square metre terminal is designed to cater to five million passengers annually. It is equipped with 8 aerobridges. The terminal features an in-line baggage scanning system and a state-of-the-art sewage treatment plant. It has 75 check-in counters, 22 immigration counters for departures, 18 immigration counters for arrivals, 14 security check booths and 8 customs counters. The basement of the four-level terminal has utilities like electricity and cargo handling. The check-in counters are placed on the ground floor while the first floor has security check booths. The second floor has the security hold area where passengers may wait before boarding an aircraft. The old terminal buildings were shut down after the commissioning of the new terminal. Several European charter airlines fly to Goa seasonally, typically between November and May. Flights from the UK (London Gatwick & Manchester Airport) are operated by TUI Airways and Thomas Cook Airlines. In addition, Finnair flies to Helsinki from the airport as a seasonal flight. There are also several seasonal charter flights to various Russian cities. Dabolim's air traffic control is in the hands of the Indian Navy, which earns revenues from this service on account of aircraft movements. Landing fees are of the order of ₹17,000 (US$240) each while Route Navigation Facility (RNF) Charges are about ₹7,400 (US$100). The Airports Authority of India could be eligible for aircraft parking fees of ₹10,000 (US$140) per day. It receives a part of the passenger service fee which is shared between it and the Central Industrial Security Force (CISF). The AAI's prime source of earning is from non-traffic services like passenger facilitation, car park, entry tickets, stalls, restaurants and shops at the main terminal building and advertising boards. With such revenues at an estimated ₹900 million (US$13 million), Dabolim Airport is one of only a dozen "profitable" airports of the Airports Authority of India (AAI). Capital expenditures (such as for runway expansion) at the airport are covered by AAI. The Dabolim Airport runway has increased in length over the years from about 6,000 feet (1,829 m) initially to 11,345 feet (3,458 m) as of April 2013 and can accommodate Boeing 747s. There is a shortage of night parking bays which are at a premium in metro airports like Mumbai. A local association has estimated that about 40 hectares are needed for the civil enclave in comparison to the 14 hectares earmarked at present. By 2005, total passengers had increased to 987,700 (1944 domestic plus 762 international passengers per day, year unspecified). The figure for 2004–05 was placed at nearly 1.3 million giving a daily average of 3,467. Data for April 2005 and 2006 are given in an Airports Authority Of India report. The airport director has claimed that 2.2 million passengers used the airport in CY 2006. This rose to about 2.6 million in CY 2007. The airport is ranked among the top ten in the country in terms of passenger traffic. Airport authorities consider that it has been operating at saturation levels since 2004. Today, Goa's estimated 1200 international flights per year account for some 93% of India's international charter tourist flights. It is estimated that about 300 to 350 thousand international tourists arrive at Dabolim on charter flights. Goa's total international tourists (roughly double the charter passengers) account for 5–10% of the national figure and 10–15% of the country's foreign exchange receipts from tourism. As the weekend morning hours approach saturation due to waves of chartered flights especially from the UK and Russia, attention is shifting to the night and early morning hours of weekdays for accommodating such flights. Tourists from UK to Goa by air were estimated to number about 300,000 in 2013–14 while those from Russia numbered about 49,000 (by 280 charter flights) in the same period. The air station of the Indian Navy at Dabolim was transferred here from the Sulur Air Force Base in Coimbatore after the annexation of Goa in December 1961. In 1983, the Indian Navy began inducting the BAE Sea Harrier into service, basing training activities at Dabolim. Now the base houses MiG-29KUBs, the tandem two-seat operational trainer variant of the carrier based MIG-29Ks. The aircraft has been inducted into the Navy with a complement of 12 MiG 29Ks that have been purchased with the aircraft carrier INS Vikramaditya (re-fitted and refurbished Admiral Gorshkov of the Russian Navy). A mock-up of the 283-metre (928 ft) INS Vikramaditya deck has been built at Dabolim Airport for training purposes as the aircraft carrier is slated to be based at Karwar. Besides the operation of STOVL aircraft such as the BAE Sea Harrier, the Navy also operates Kamov Ka-28 anti submarine helicopters, along with IL-38 May and TU-142M Bear aircraft. Dabolim airbase also hosts exercises by the Indian Air Force's fighter bombers and it has facilities for the Indian Coast Guard which operates a fleet of small aircraft such as Dornier-228s. The Indian Navy also carries out long range maritime patrols as far as the Horn of Africa from Dabolim using unarmed aircraft such as the Ilyushin Il-38. This activity has assumed significance recently due to a spate of pirate attacks in the area on maritime shipping involving Indian crews. The Navy has an aerobatic team, based at Dabolim, called the Sagar Pawan. The team comprises three Kiran aircraft which carry out aerobatic displays at various locations in the country. The team is used in one or two annual public events in Goa for flypasts of 15 to 20 minutes duration. The Navy also operates a naval aviation museum near Dabolim Airport. Military flight training at Dabolim is carried out on five days of the week from 0830 hrs to 1300 hrs, during which hours civilian flights cannot operate. Some exceptions have been made on rare occasions by the naval ATC, chiefly in the case of foreign airlines. Charter airlines carrying international tourists during the season tend to use the freer civil aviation regimes on weekends (Saturday and Sunday) and in the early morning hours. The blocked time is about 15% of the total on a weekly basis albeit during peak morning hours for civilian flights. Recently,[when?] the Navy released a few hours blocked in the evenings on two weekdays for civilian flights, thus easing the overall congestion being faced. There has been a demand in local political circles for the restoration of Dabolim's civilian status by relocating the Indian Navy' air station to the proposed Karwar airfield in the new INS Kadamba naval base at Karwar, 70 kilometres (43 mi) south of Dabolim in the adjoining state of Karnataka. However, the Indian Navy's top officers in Goa have hinted that the investment at Dabolim naval air station is ₹7.5 billion (US$100 million) and that it would be impossible to replicate this at Karwar. An estimated 5,000 tonnes (5,500 short tons) of cargo were handled annually as of a few years ago[when?] and may have declined since then. Most air cargo is carried in the belly-space of airlines such as Air India rather than in dedicated freighters. As of 2016, all domestic cargo is handled at Dabolim airport. GoAir, Vistara and other airlines use AAI's facilities, including machines, to process cargo during non-peak hours. AAI has plans to build and operate a 24x7 cargo terminal at Dabolim in the old international terminal. Once completed, the common user terminal for cargo would be able to cater to both domestic and international cargo flights on a continuous basis. Passengers can reach the airport using taxis, buses, trains, or automobiles. Public buses go to the nearby city of Vasco da Gama, approximately 4 km (2.5 mi) away, and also stop at the closer Chicalim bus stop, about 1.5 km (0.93 mi) from the airport. Local mini-buses connect both Vasco da Gama and Chicalim to the airport. Pre-paid taxis are available from the airport. There are various new transportation plans in the works, including the addition of a second bridge. Meanwhile, plans for a 6-lane, north-to-south expressway are on hold in Goa. A monorail system is also being considered. All these plans have implications for the proposed Mopa Airport and its link to Dabolim and Goa's population centres. Railway tracks of Indian Railways, which also run through Goa, pass beside the airport. The nearest station is Dabolim railway station. The port at Mormugao is located about 5 km (3.1 mi) away. Konkan Railway provides services to Margao in South Goa, Tivim in North Goa, Carambolim, and Ponda. On 1 October 2002, two Ilyushin Il-38s collided and crashed near Dabolim Airport killing 12 naval personnel in the planes and 3 civilians on the ground. On 15 October 2012, two pilots and a technical sailor on board a HAL Chetak helicopter of the Indian Navy were killed after the helicopter crashed whilst landing towards the eastern side of the runway. On 27 December 2016, Jet Airways flight 9W 2374, a Boeing 737-800 jetliner took a 360 degree spin as it veered of the runway damaging the landing gear. Of the seven crew members and 154 passengers, 15 passengers suffered minor injuries. On 3 January 2018, A MIG-29K fighter aircraft of the Navy with an trainee pilot crashed off the runway during takeoff at the Goa airport, there were no casualties in the incident. ^ Business Standard (16 May 2010). "Two airports likely for Goa". Business-standard.com. Retrieved 9 May 2012. ^ "GMR Infra to develop Mopa airport in Goa". The Economic Times. ^ "Goa government notifies planning area at Mopa". The Times of India. ^ "Os Transportes Aéreos da India Portuguesa". goancauses.com (in Portuguese). Archived from the original on 6 February 2012. Retrieved 9 May 2012. ^ Gabriel de Figueiredo. "A tale of a Goan Airport and Airline". Archived from the original on 15 December 2012. Retrieved 20 February 2013. ^ a b "New Dabolim terminal to be ready by June". The Times of India. 8 May 2013. Retrieved 19 May 2013. ^ "New international terminal building for Goa Airport". Press Information Bureau. 26 May 2006. Retrieved 31 December 2013. ^ "New Integrated Terminal Building Inaugurated at Goa Airport". Press Information Bureau. 3 December 2013. Retrieved 31 December 2013. ^ "New Dabolim airport to be ready by year-end: Manickam". Navhind Times. 19 April 2012. Archived from the original on 21 June 2012. Retrieved 12 July 2012. ^ "Soft opening of new Dabolim airport terminal on Dec 19". Navhind Times. 8 November 2013. Archived from the original on 23 May 2014. Retrieved 31 December 2013. ^ "Arkia to launch 2 Israel - India routes". Globes. Retrieved 12 February 2019. ^ "Astana Leisure 2014". Retrieved 18 February 2019. ^ "SpiceJet Schedule". Retrieved 12 March 2016. ^ "Goa – VAGO". World Aero Data. Retrieved 18 April 2013. ^ HASG. Series of four infomercials titled "Save Dabolim Save Goa" in Herald and Navhind Times. March/April 2006. ^ "azfreight.com". Azworldairports.com. Retrieved 9 May 2012. ^ "The Skies Open Up Over India." Travel Daily News. 26 October 2005. ^ D'Cunha, C. "Room for more flights at Dabolim: Adm. Mehta". Goa Plus (The Times of India supplement). 5 January 2007. ^ "Bid to build cargo terminal at Dabolim suffers setback". The Times of India. 28 October 2015. Retrieved 3 January 2017. ^ Category: Aircraft. "''Illyushin Il-38 ''". Bharat-rakshak.com. Retrieved 23 June 2018. ^ "Two Navy aircraft collide in Goa, 15 dead - Times of India". The Times of India. Retrieved 3 December 2018. ^ "Collision carnage at celebration". telegraphindia.com. Retrieved 3 December 2018. ^ "Navy copter crashes at Dabolim airport; 3 killed". The Navhind Times. Navhind Papers & Publications. Archived from the original on 20 October 2012. Retrieved 20 February 2013. ^ "Jet Airways Flight Veers Off Goa's Dabolim Airport Runway". NDTV.com. Retrieved 8 February 2018. ^ "Goa Jet Airways accident: 15 passengers suffer minor injuries; DGCA begins probe". The New Indian Express. Retrieved 8 February 2018.